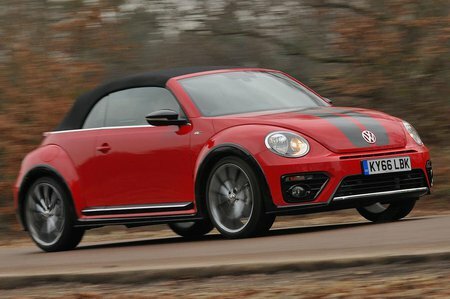 Volkswagen Beetle Cabriolet Performance, Engine, Ride, Handling | What Car? 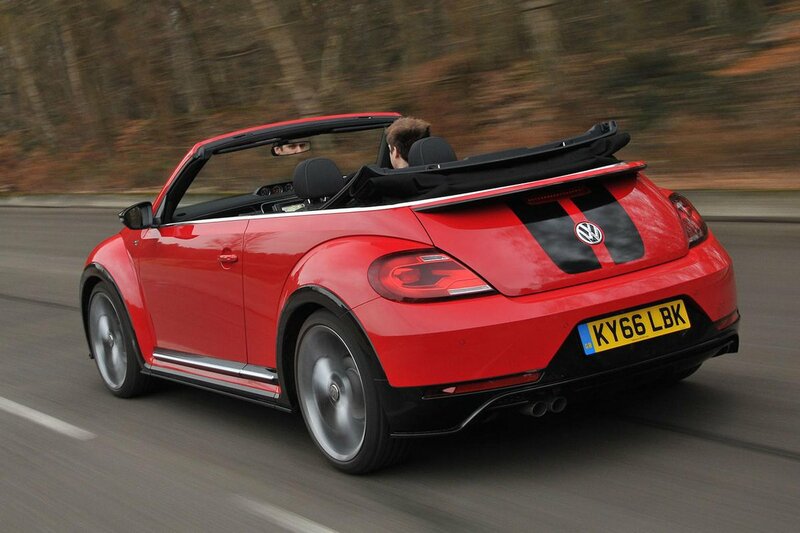 The Beetle Convertible is best sampled in its cheaper guises – namely the 1.2 petrol engine, on smaller wheels. In this form, you get the sweet-revving engine, a slick six-speed manual gearbox and a package that feels keen enough, yet is also reasonably comfortable. The 1.4 petrol (all the engines are turbocharged) is the best to drive of the bunch, since it is refined and yet delivers usefully better performance than the slightly weedy 1.2. However, it is quite a bit more expensive than the 1.2, and the Beetle Convertible doesn’t encourage rambunctious driving anyway, so we’d stick with the lower priced and slower, but in its own way just as enjoyable, 1.2. The 2.0-litre diesel is offered in 108 or 148bhp outputs and might be tempting for its potential economy and mid-range grunt, but it’s noisy and expensive, and gets a five-speed manual gearbox as standard, so it’s best avoided. A dual-clutch automatic is offered on all but the manual-only 1.4 petrol engine, but the 2.0 TDI 150 gets a six-speed auto where the 1.2 TSI and 2.0 TDI 110 get seven-speeders. Seek out some enticing corners in the Beetle, and you’ll enjoy the progressive and well-weighted steering, but otherwise this is no handling spectacular. In fact it’s more of a noncommittal shrug in that area. There’s enough cohesion in the steering, pedal responses and build of power to make it easy to drive smoothly, but it always feels like quite a heavy car, with a tendency to wash wide in hard cornering and with not much feedback through the steering. When it comes to ride, stick to smaller alloys and you get a soft-edged, if lumpy, ride comfort. Avoid any wheels bigger than 17in and, whatever you do, don’t add sports suspension (an option only on R Design trim), since it makes the Beetle crashingly uncomfortable over poor urban roads and doesn’t improve the handling. Regardless of which model you opt for, you’ll still feel the body flexing and shuddering due to a shortage of rigidity, particularly when dealing with mid-corner bumps. Certainly, a Mini Convertible has better damper pliancy and is way more fun to drive in general. Refinement is reasonably good with petrol engines fitted, but the diesel sends lots of vibrations through the pedals and sounds gruff much of the time. There’s always a bit of wind noise over the windscreen and around the roof join, but with the roof up it’s easy to have a conversation with your passenger even at motorway speeds. The wind deflector is a chunky plastic unfold-it-and-fit-it-yourself job that takes out the rear passenger space. Even so, it does reduce buffeting considerably when you’re on the move, and few buyers will routinely carry people in the back, so it’s worth having.